Most of the time men see urinals in commercial facilities. On rare occasion we’ll see a house (typically where a man is living alone) that accommodates a urinal in the master bathroom. When urinals clog or plug up, (which is often) most of the time they overflow which causes a mess. The reason why the water runs over and doesn’t stay in the bowl is because most of the time the setting is set with lot of water pressure. Besides having a mess to clean up, working on urinals and cleaning and unclogging them is not as easy as one should think. Removing a urinal from the wall is harder then removing a toilet from the floor. 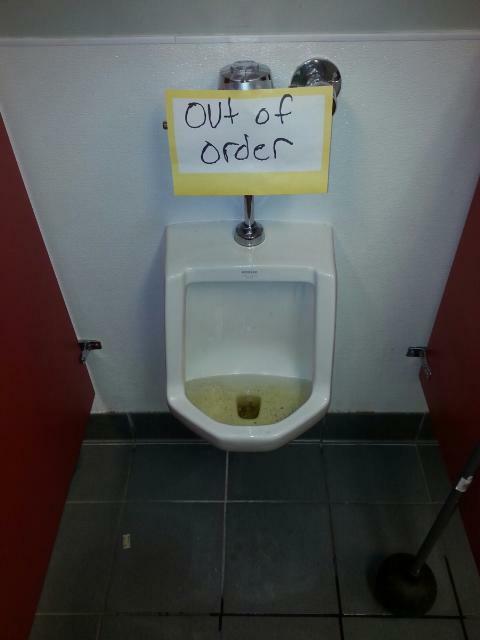 You must be real careful with handling a urinal or it can break unexpectedly. Hiawatha Plumbing removes and unclogs urinals almost daily in commercial properties some of which include office buildings, doctor offices, health clubs, restaurants, schools & malls. Most people don’t enjoy working on them because of the smell of them and how dirty the are. Next time you have a clogged or plugged up urinal call Hiawatha Plumbing for help. We’re here for you and we’ll take care of the mess.